CLICK HERE ​for a printable area birding map courtesy of Lake Erie Shores & Islands! Just north of Ohio State Route 2, at the entrance to Magee Marsh Wildlife Area, the headquarters for Black Swamp Bird Observatory is immediately to your left. The Observatory is open on weekends year-round, open several days per week during migration season, and open every day during May. This is a good place to stop to get the latest information on sightings and hotspots, birding area maps designed by Kenn Kaufman, check out the fabulous selection of bird and nature books in the gift shop, and meet fellow birders. Behind the building is the Gallagher Memorial Trail, a walking trail leading through woodland edge, second growth woods, and meadow, all of which are often good for migrants. The Gallagher Trail also provides the area's best opportunity to experience the bizarre and dazzling display of the American Woodcock. The Window on Wildlife in the Observatory’s gift shop is often a good place to see orioles, grosbeaks, and other birds visiting the feeders, and warblers and other songbirds visiting the water garden. See our Woodcock Extravaganzas under Field Trips. ​The park’s campground and beach are popular in summer but the area is outstanding for birding all year, with marshes, woods, and big concentrations of migrant songbirds in season. East Harbor lies on the fringe of Ohio's prairie marsh zone. These wetlands are remnants of the Great Black Swamp which once covered an area 120 miles long and 30 to 40 miles wide. These wetlands produce more wildlife than any other type of habitat in Ohio. Large numbers of ducks, geese, gulls, terns and other migratory waterfowl delight birdwatchers. Middle Harbor is a game sanctuary where black-crowned night herons, egrets, great blue herons and other shorebirds find refuge. Thousands of migrating songbirds rest here before winging north across the lake. the coast of one of the nation’s most valuable resources, Lake Erie. ​This beautiful island (accessible by auto ferry from Marblehead, on Route 163 east of Port Clinton) is a popular vacation spot, but also a fine birding area, especially during migration. See our Kelleys Island Guided Birding Excursions under Birding by Jet and Ferry. For Ferry information, click HERE. ​Directions to Magee Marsh: The entrance road leads north from Ohio State Route 2 about 18 miles east of Toledo and 16 miles west of Port Clinton, or 1.5 miles east of State Route 590, 1.5 miles west of State Route 19. Together with the Ottawa National Wildlife Refuge which is directly to the west, Magee Marsh Wildlife Area is perhaps the largest uninterrupted area of coastal wetlands habitats remaining in Ohio. There is a trail that connects the two areas. The Ottawa-Magee Partnership trail is a one mile trail that goes from the Bird Center over to the parking lot of the old Ottawa NWR office. Half a mile north of Ohio State Route 2 is the Sportsmen’s Migratory Bird Center, the center for the Division of Wildlife’s wetland research programs. It is open to the public and has good interpretive displays. Restrooms are located here and open during the Bird Center's hours of operation. Also located here is the “hawk watch” observation tower which provides views over the marsh. 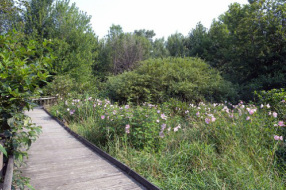 A walking trail behind the center leads through a swampy woodland and around some small ponds, and often offers many warblers and other migrants. Beyond the Sportsmen’s Center, the Magee causeway runs straight north across the marsh. Three gravel pullouts on the east side of the road offer easy parking. The Magee Marsh Wildlife Area extends a short distance west and far to the east of here. The causeway offers opportunities to see many wetland birds. Swans, geese, ducks, herons, egrets, rails, Marsh Wrens, Swamp Sparrows, and others are often easily seen along the causeway. To learn more about Magee Marsh Wildlife Area, click HERE. ​Directions to Magee Marsh: The entrance road leads north from Ohio State Route 2 about 18 miles east of Toledo and 16 miles west of Port Clinton, or 1.5 miles east of State Route 590, 1.5 miles west of State Route 19. The boardwalk is located adjacent to the large parking lot at the end of the road, about a mile and a half north of Ohio State Route 2. The name of this spot is subject to confusion – it is sometimes called the “Crane Creek Bird Trail,” sometimes just the “Magee Boardwalk” – but whatever it is called, it is one of the most famous birding sites in North America during the month of May. The boardwalk meanders through 7 acres of woodland situated on the beach ridge between Lake Erie and extensive marshes. Migrating birds moving north in spring often pause here just before crossing the lake, and the woodland often swarms with such migrants. The boardwalk can be absolutely fantastic for close-up views of warblers, vireos, thrushes, and other songbirds, and during the peak of migration it is not unusual to have 26 or more species of warblers at eye level during the course of a day’s birding. Sometimes the best birding is on the north edge of the woods (south edge of the parking lots), especially early in the morning while things are quiet along the boardwalk inside the woods, and especially with south winds. The beach on the north edge of the parking lots is always worth checking for shorebirds, terns, flocks of ducks offshore, and gulls resting on the short breakwaters. ​This 402 acre marshland is a prime viewing area for migrant waterfowl (especially in March and April), and nesting marshland specialties during the breeding season. In addition, the Mallard Club Marsh has excellent potential for vagrants, such as the male Garganey seen in May of 2002. Access to the marsh is limited to the 2 small parking areas on Cedar Point road. From either of these bases, you can walk around the dikes and view different impoundments. There is excellent cattail marsh in several impoundments, and sought-after species like American and Least bitterns and even Yellow-headed blackbirds and King rails are present in very low numbers in most years. May and June is the best time to look and listen for these birds. The Black Tern likely nests in the adjacent (and off-limits) Cedar Point marsh, and can be occasionally seen from the dikes at Mallard Club Marsh. Hunting is a popular activity at the marsh, so the best (and safest) birding can be enjoyed in the spring and summer months. Beginning in March, large numbers of the 20 regularly-occurring Ohio ducks can be seen in the marsh itself or in adjacent Lake Erie waters just to the north. Spring hawk flights are also possible, so be sure to watch the skies in March and April. There is little woodland habitat, and as a result, very few woodland birds. ​The wetlands of the Maumee Bay area offer a vivid array of natural wonders. Wetlands contain more species of wildlife than any other habitat type, including: fox snake, northern water snake, painted turtle, chorus frog, green frog, spotted salamander, raccoon, muskrat, dragonfly, caddis fly, and water striders. Over 300 species of birds have been recorded with shorebirds such as snipe, Great Blue Heron, Common Gallinule and Ring-billed Gulls residing with waterfowl including Canada Geese, Northern Pintails, Redheads, and Ruddy Ducks. Songbirds include the Red-winged Blackbird, Yellow Warbler, Killdeer and Swamp Sparrow. Spring migration brings many others including the colorful warblers. The plant life is diverse as well. Cattails, buttonbush, bur-reed, cottonwood and black willow are just a few examples of the marsh plants at the park. ​Located on E. Bayshore Road one-half mile west of Dempsey Access. Amenities: Picnic table, park benches, observation deck, paved biking/walking trails, grass and mulched walking trails along the prairie and in the forest. Scenic views of wetland marsh. For information about the marsh, click here. ​Just east of the village of Bono, the east-west highway of Ohio State Route 2 makes a major curve to run south. The well-marked turnoff to Metzger Marsh Wildlife Area is on the curve. This 558-acre marsh is outstanding for waterfowl in migration and for nesting marsh birds in summer. This is often a superb place to find bitterns, Black Tern, and Yellow-headed Blackbird. The small woodlot at the end of the road is sometimes excellent for warblers and for a wide variety of other migrant songbirds, while the lake shore is worth checking for gulls, terns, waterfowl, and a few shorebirds. ​The Oak Openings region was so named because originally, the trees grew so far apart that early settlers could drive wagons through the woods in any direction. Situated on the southwest edge of the greater Toledo area, the Oak Openings still occupy almost 5,000 acres with black oak savanna, oak woodland, and wet prairies. This collection of habitats is one of the rarest in the Midwest. Birders know the Oak Openings not only for the many migrants to be seen here, but for the remarkable combinations of breeding birds that are rare elsewhere in northwest Ohio. Among the many specialty birds to be found nesting here are Lark Sparrow, Summer Tanager, Blue Grosbeak, Red-headed Woodpecker, Acadian Flycatcher, Blue-winged Warbler, Prairie Warbler, Hooded Warbler, Pine Warbler, and Yellow-breasted Chat. Part of the Toledo Metroparks, a visit to the Oak Openings Preserve is sure to spice up your trip list with some birds that you haven’t seen in the migrant traps along the lakeshore. See our Guided Bus Trip to Oak Openings Preserve under Field Programs. ​With its entrance located on Ohio State Route 2, about half a mile west of the entrance to Magee Marsh Wildlife Area, Ottawa National Wildlife Refuge encompasses more than 5000 acres of managed wetlands, forests, and prairies. The refuge protects major populations of birds and offers good birding practically every day of the year. The Visitors’ Center is a good place to start. The center itself has fine interpretive displays, knowledgeable staff and volunteers, a bookshop, and an elevated observation deck. Trails immediately behind the center lead to a boardwalk through a beautiful swampy woodland and connect to the rest of the entire trail system. The trails also can be accessed from another parking lot (see map), and it is worthwhile to walk the trails in the eastern part of the refuge to access impoundments that may be good for shorebirds, waterfowl, rails, moorhens, and other birds. The woodlots in this area, and the small trees along the edges of the impoundments, often hold large numbers of warblers and other migrants. The auto tour route accesses many other areas of the refuge, often including spots that are very good for shorebirds, bitterns, Yellow-headed Blackbirds, and other species. For an overview of birding on the refuge, click HERE for the ONWR Overview map, for information about birding along the Auto Tour route, click HERE for the Auto Tour map and for information about birding along the trails that are open every day, click HERE for the ONWR Walking Trail map. Directions: Pearson Metropark is about 15 miles west of Magee Marsh andis accessed from its entrance on Lallendorf road from State Route 2. Varied habitat affords the birder an opportunity to build a long list of birds.From the main parking area off of Lallendorf road, there is a Visitor's Center area that has good restrooms and an interesting Window on Wildlife. The Window on Wildlife can attract interesting species to either the feeders (Indigo Buntings, Purple Finch, Rose-breasted Grosbeaks are regular) or the water feature. The trees around the parking area itself often play host to numbers of warblers and other spring migrants. There are trails that go through an excellent example of remnant Black Swamp forest and you are likely to encounter a good number of birds, including some common ones that are hard to find at Magee proper: Tufted Titmouse, Hairy Woodpecker and White-breasted Nuthatch all come to mind. You are also likely to encounter Scarlet Tanagers, Ovenbird, Eastern Wood Pewees and with luck, a Cerulean Warbler. By exiting the park at Lallendorf road to the right (north), you will come to what is known as"Pearson North",along the east side of the road. These 300 acres ofopen country and wetland serve different bird communities and there are gravelpull-offs that will allow you safe access along Lallendorf. Look and listen for Eastern Meadowlarks, Horned Larks, Savannah, Grasshopper and Vesper Sparrows among others. Continuing north along Lallendorf, you will cross Seaman Road,where you will turn right (east). There are additional pull offs along Seaman road, especially at the east end. The habitat gets wetter the furthereast you drive, and there could be a fair number of shorebirds here. Also look and listen for Virginia and Sora Rails in the cattail stands, as well as Marsh Wren. If you turn right (north) on Wynn Road,this will be the final leg of your journey to Pearson North, and this road will lead you back to State Route 2. ​On the north side of U.S.Highway 6, about 7 miles east of Fremont. A little more than half a mileeast of County Road 256 is a parking area with an observation tower giving anoverview of part of the area, and trails along the dikes provide access. Often an excellent area for shorebirds and waterfowl in migration. ​From U.S. Highway 6 on the east side of Sandusky, turn north on Cedar Point Drive, then turn right at River Avenue (just after the McDonald’s). The small parking lot for Pipe Creek is at the end of River Avenue. Impoundments are good for shorebirds, waterfowl, and wading birds, while the woods hold fallouts of songbirds during migration. Note that traffic going to Cedar Point Amusement Park can be very heavy on warm weekends. ​Entrance is on the north side of U.S. Highway 6, about six miles east of Sandusky and about two miles west of Huron. Trails lead out to Lake Erie shoreline. Good for marsh birds most of year; woodlots host big concentrations of migrant songbirds in spring and fall.